When we came up with the idea for this Month of Makeovers I knew I had a perfect project to delegate to a real craftsman. We met Jared DeSimio, Maker at the Vintage Bazaar in June. He had an impressive display of totes and bags he had made in his workshop in Brunswick, Maine. 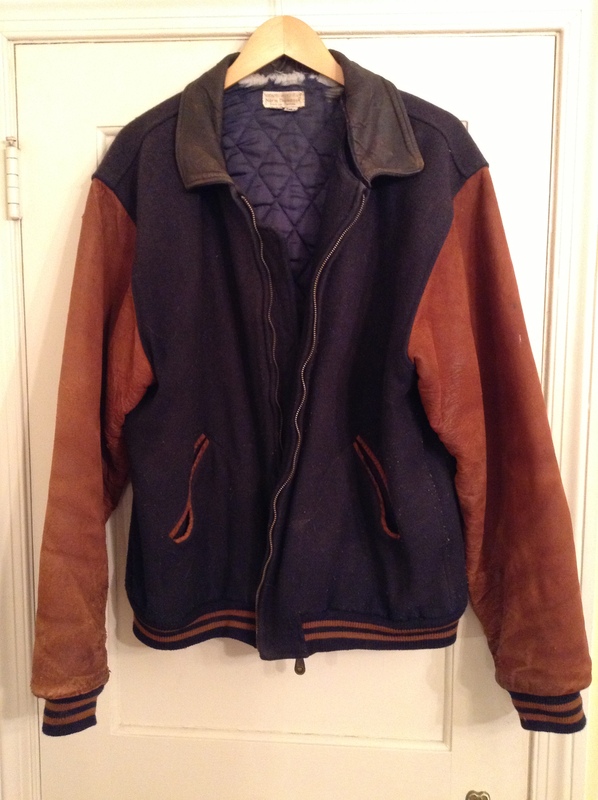 I thought of him when I was trying to decide what to do with this battered jacket that used to belong to my father. The sleeves were worn so badly it couldn’t be donated; it would have to go in the trash. Or get remade. I contacted Jared through his Etsy shop and he set up a listing for a custom tote. I was surprised that he went on to post an entire facebook image gallery showing some of the steps of the tote construction. I could see from the photos that the tote was done. YES!! A few days later the mailman stuffed a huge box in our doorway. Here’s what was inside. 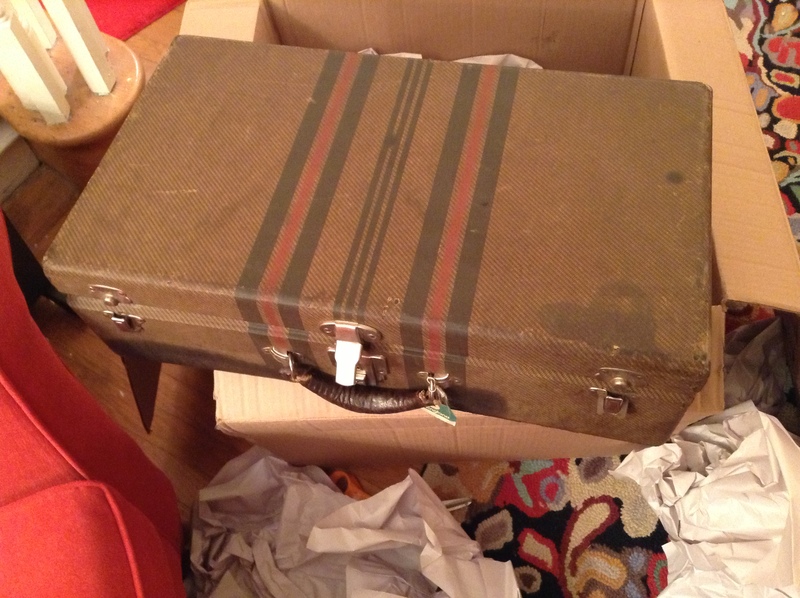 A super vintage suitcase! Wow! 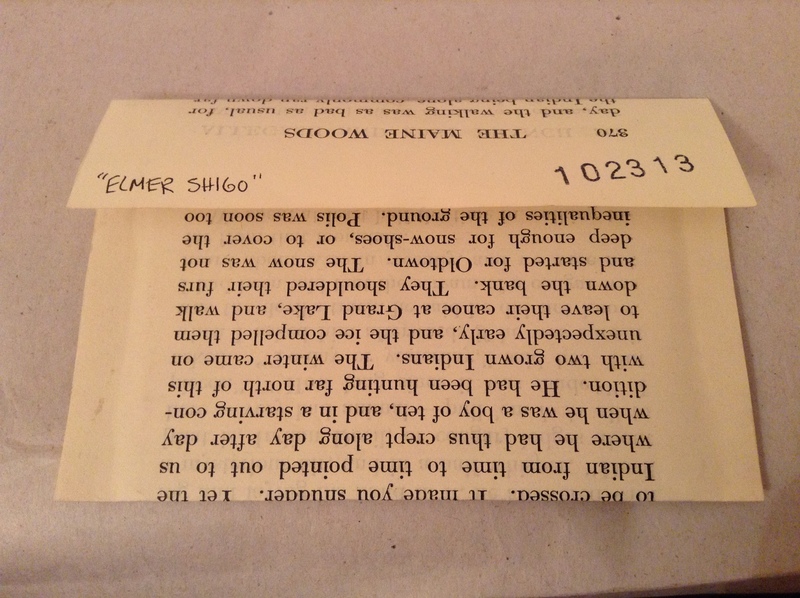 When I opened the suitcase I found an envelope upcycled from an old book. That made me smile even more. 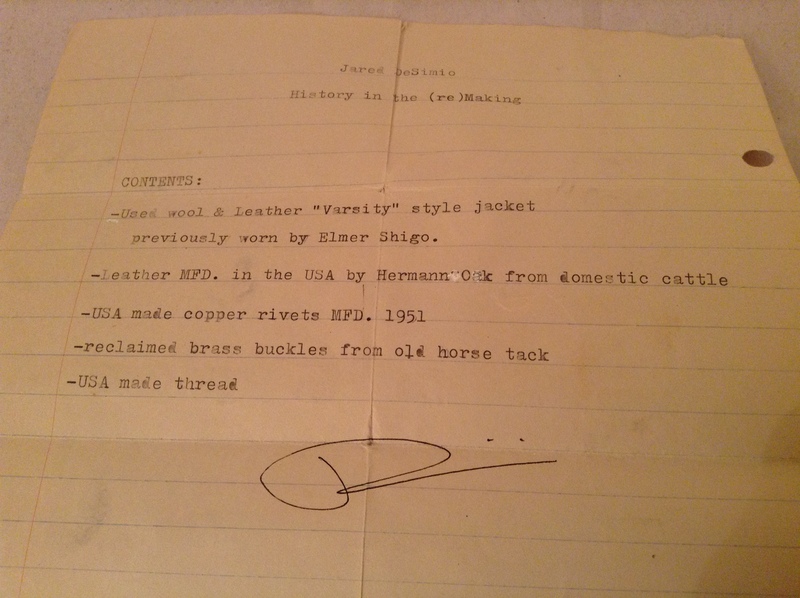 The envelope held a list of all the materials Jared used to make the tote. The paper was recycled, too. I took a deep breath and peeled back the wrapping paper. And then I cried. 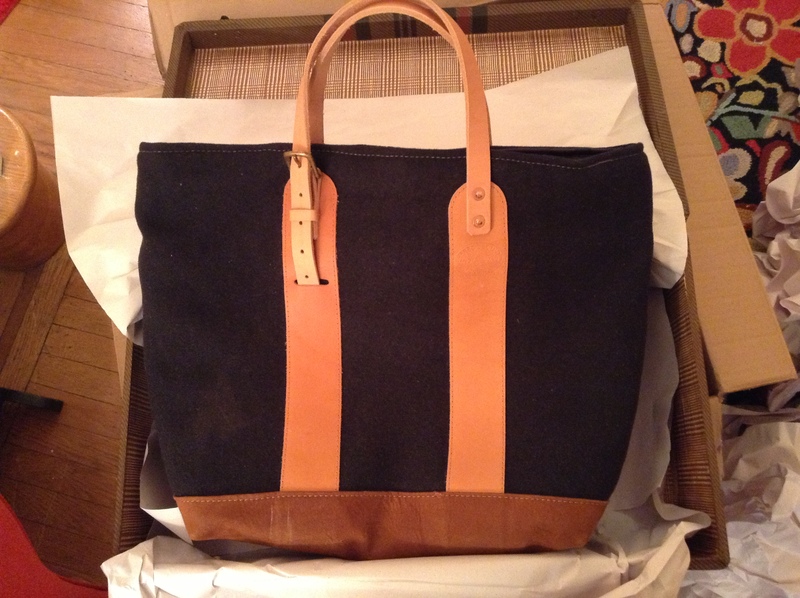 The tote is just as wonderful as I imagined. My dad would have loved it even though he wasn’t a tote-carrying kind of guy. Dad spent his whole life making and remaking things. When we cleaned out his workshop we discovered a box of leather scraps–including pieces from his old shoes. Reusing his old jacket would have made perfect sense to him. I’m sure he’d admire and appreciate Jared’s meticulous craftsmanship. I do! I have my Dads navy uniforms from WWII…..I’d love to do something with them other then let them hang in the closet. Thank you, Jane! I’m so impressed with Jared’s work. And I love your idea of using the uniforms to make something special. Let us know what you come up with! Yes, I agree! Jared gives 110% to every detail. I couldn’t be more impressed. 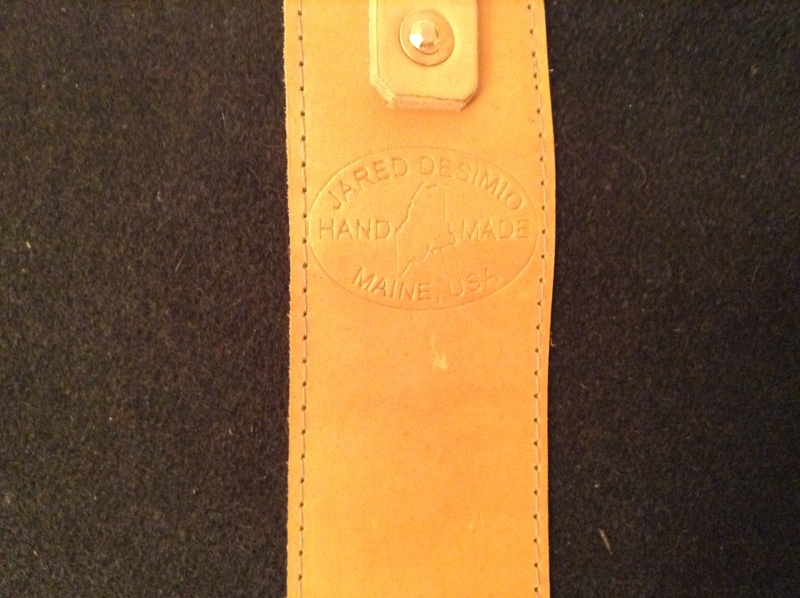 I’m a proud Jared DeSimio bag owner myself, and the only thing I can imagine being better than what I have is if it was made out of something of sentimental value to me. The recycled, thoughtful note on the materials blew me away too! Love it. Thanks, Jessie! Yes, you expect to get a fantastic one-of-a-kind bag, but the packaging and details make it even more special. I hope he gets the success of his dreams–and more. Wow, this is sooo cool!